The Inverness Branch of William Johnston & Company Limited, having opened over 45 years ago, is well known to many businesses, large and small, in the North of Scotland. The present factory, which opened in 1982, is based in Longman Industrial Estate, Inverness allowing easy access to the A9 carriageway. Customers from Perth to the Shetland Isles, and everywhere in between, have come to rely on our highly knowledgeable and motivated staff. Having its head office and larger manufacturing facility in Glasgow allows the Inverness branch to capitalize on economies of scale both in terms of production and cost which has resulted in continual growth and improvements over the years. The recent investment by way of the internal and external refurbishment of the trade-counter, reception and office areas of the premises reflects the company’s commitment to the future of its Inverness business. Specialising in fasteners, both standard and bespoke, and a range of gaskets, joints and seals, the range of products manufactured and supplied by the branch, which is backed up by full technical support on all sealing issues, continues to grow. Studbolts, engineering studs, hex head bolts and setscrews, socket head caps crews, decking screws along with galvanized, stainless steel and zinc fasteners in a range of grades are available mostly from stock. 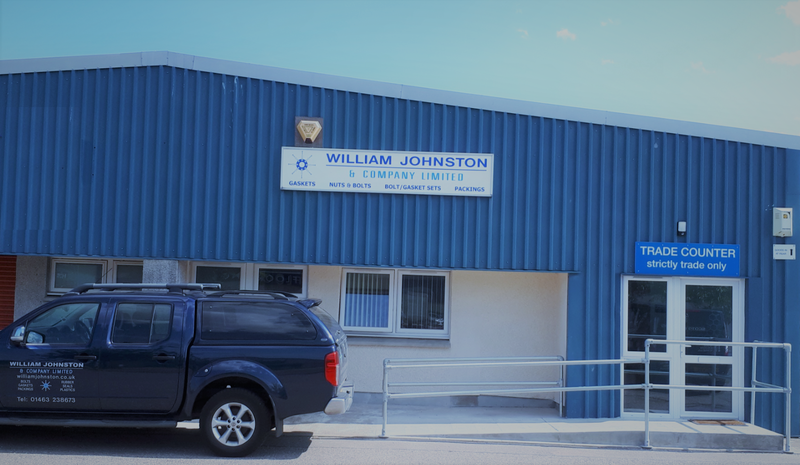 William Johnston & Company Limited is the largest supplier of Rilsan fasteners in the UK and offer these from our Inverness branch. In addition, 3.1 Mill certification can be offered on many of the specialist fasteners supplied. As well as being main suppliers of sealing solutions to the pipeline and engineering sectors throughout Scotland, William Johnston & Company Limited has an established reputation in the distilling industry. The Inverness branch services the Highlands and Speyside regions of the industry, has decades of experience and product knowledge and is the Scottish distributor for the “Flexidram” fire rated and EC1935:2004 (FDA) compliant gasket.